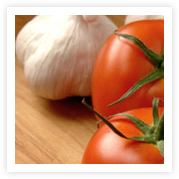 Kings Gourmet Foods | Gourmet Quality, Excellent Values. At King’s Gourmet we believe that great foods can also be simple. Time-honored ingredients, carefully prepared for the delight of your senses. 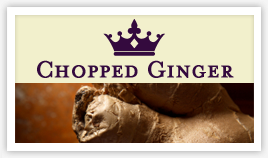 Whether you select a single ingredient like our freshly chopped ginger in canola oil or one of our finished pesto sauces, you will enjoy the uncompromising quality packed into everything we do. Simple really can be great! We apply our “FACT” test to all product recipes: FLAVOR, AROMA, COLOR & TEXTURE. Achieved without the use of preservatives, imitation colors, imitation flavors, overcooking or canning. Our recipes are created with you in mind, delivering products that we are proud to share with our family and friends. To add the best quality controls possible, our products are all “micro batch processed” We literally inspect every package before we bring it to market. Each product is packaged in a convenient one quart jar or an economy size 40 LB tub. For food safety we don’t use glass. Our lightweight plastic tubs are easier to work with, freeze well, contain less resin and are therefore better for the environment. Of course, our containers are 100% recyclable and reusable. 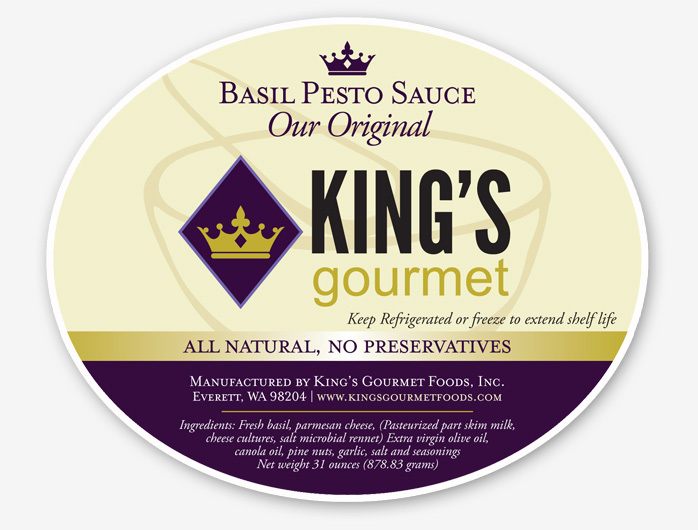 King’s Gourmet fresh products are available in the following pack sizes: 16 oz tub, one quart tub (31 to 32 ounces) and the jumbo size 40 tub. Weights vary for each item. Look for new sizes and new recipes as we continue to grow. For our distributing partners: Consider partnering with us today. We provide exciting growth programs. We do custom packs too. If you have a favorite you would like us to make or would like a private label/co-pack of our line, we will do it right. On time at a great price! We are local to the Pacific Northwest. Our goal is to give back to the communities where we all live. King’s Gourmet Foods products can be found at the best food service distributors and produce vendors. We sell direct to food manufacturers We are distributed throughout the Pacific Northwest and British Columbia. If your distributor doesn’t yet carry King’s Gourmet, just ask them to. To receive King’s Gourmet Foods products, please request them through your local quality food service distributor or produce vendor. Contact us relating vendors in your area. If you are manufacturer, we can service you direct. No guesswork, no labor. NO WASTE. Just the vibrant flavors of fresh ginger root. We painstakingly peel and chop fresh ginger to perfection. Two tablespoons equals one “thumb” fresh ginger root. 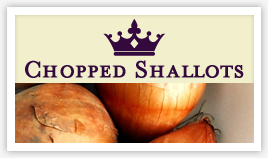 As with our shallots, you can freeze it and scoop it while frozen. Use directly from the container. You may even freeze and scoop like ice cream. Use everywhere you use onions for a truly unique and gourmet twist to any recipe. two tablespoons equals a medium size shallot. With oil or in water: Enjoy the fresh flavor of King’s Gourmet chopped garlic in oil. No off flavors. No off colors. No preservatives. 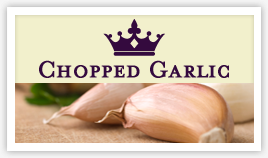 Use in any recipe calling for chopped garlic. One teaspoon equals two cloves of fresh garlic. Fresh cloves of garlic. Batch roasted to perfection then chopped to a wonderful chunky consistancy. We add vegetable oil, salt and lightly season. Smooth, nutty flavors are achieved. Our original! 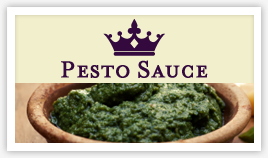 We take carefully prepared fresh sweet basil tops and combine them with old world ingredients. Extra virgin olive oil, pine nuts, walnuts, parmisan cheese, garlic and a secret blend of spices. Simply made. Simply delicious.